Clinique Happy For Men is a refreshing fragrance for men. Wear it & be happy. 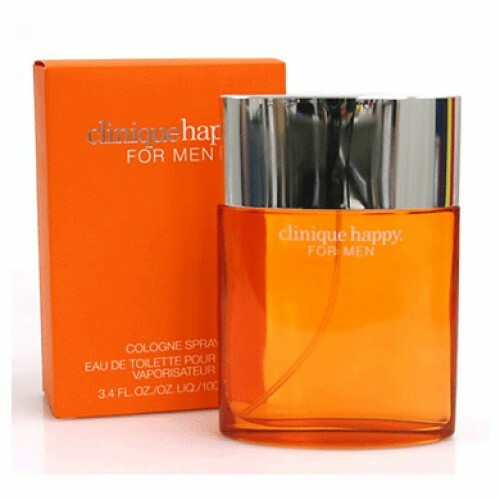 Clinique Happy For Men Cologne 100 ml. Cool. Crisp. A hit of citrus. A refreshing fragrance for men. Wear it and be happy. Team with Clinique Happy For Men and grooming favourites for longer-lasting scent. Bright young fragrance. Classic. Happiness - Today a new ideal, the most enviable and attainable by everyone, much more than money and material comfort. Based on a sense of the joy of life, "Happy" improves the emotional mood. Fresh top note, shaded by citrus tangerine and lime chords, smoothly into the "heart" of a whole bunch of colors. Woody plume gives the composition completeness through cypress, musk, cedar wood and wood "guaiac." Clinique Happy for Men by Clinique, created in 1998 - is fern citrus flavor. The combination of green and citrus notes wave covers the sun and freshness. Clinique Happy - surprisingly positive flavor, not recognizing the stiffness and conventions. It washes away all the sea border and bottled good mood. A great choice for everyday use, gives vivacity and gives a wonderful mood. Notes of juicy lime, cool green notes, mandarin sweet, ripe citrus, refreshing sea notes, freesia, jasmine fragile, spring lily of the valley, sweet rose, cypress, musk, guaiac wood and cedar. First came the female Clinique Happy - emotional cocktail of citrus and flowers. Following him to make a decent pair, the male was released Clinique Happy for Men - cool, ringing citrus fragrance for those who struggles to happiness. Transparent composition Happy For Men from Clinique begins notes lime and tangerine fruit. "Heart" Happy for Men reveals scents of greenery and the Mediterranean, and the "base" consists of cedar and guaiac wood. Bright young fragrance. Happiness - Today a new ideal, the most enviable and attainable by everyone, much more than money and material comfort. Based on a sense of the joy of life, "Happy" improves the emotional mood. Fresh top note, shaded by citrus tangerine and lime chords, smoothly into the "heart" of a whole bunch of colors. Woody plume gives the composition completeness through cypress, musk, cedar wood and wood "guaiac." For a stylish and active young people.